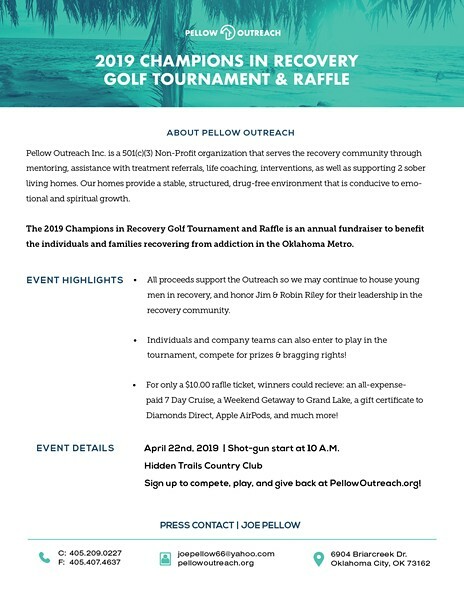 The 2019 Champions in Recovery Golf Tournament and Raffle is a fundraiser hosted by Pellow Outreach to support individuals and their families recovering from addiction in OKC. Proceeds support the Outreach so we may continue to house young men in recovery, and fight the war on addiction that affects so many lives. Individuals and company teams compete in the golf tournament for prizes & bragging rights! For only a $10.00 raffle ticket, ANYONE could win an all-expense-paid 7 Day Cruise, a Weekend Getaway to Grand Lake, a gift certificate to Diamonds Direct, Apple AirPods, and much more!